A countrys standard of living can be judged by such arcane metrics as its gross domestic product and rate of infant mortality. A far more germane measure of a nations worth, I think, is its contribution to the audiophile community. While formal studies have not been done, Im confident that, on a per-capita basis, Canada has been an overachiever in this regard, and nowhere in Canada do audio endeavors seem to flourish with more vitality than in the province to the east of me, Quebec. One could handily build several world-class audio systems using only components manufactured in La Belle Province. Their notoriously poor driving skills aside, the Quebeckers Ive known are a passionate lot who cherish food, music, and art above much else. Perhaps its these old-world values, combined with new-world enterprise, that makes Quebec the nexus of Canadas audio industry. Gemme Audio, based in Montreal, is a relative newcomer to the audio scene. Chief designer Robert Gaboury started building horn-loaded loudspeakers as a hobby over 35 years ago. Early on, he began using Peavey drivers in his designs, and the resultant speakers were used by his friends in rock bands. In 2004 Gaboury began experimenting with developing optimal enclosures for full-range Fostex drivers. A prototype enclosure was sold on a Canadian Internet audio trading site to Jean-Pierre Boudreau, an avid audiophile and tweaker extraordinaire. When Boudreau requested more, he and Gaboury decided to pool their resources to build a new cabinet design that required CNC fabrication. The two formed Gemme Audio in 2005; their first commercially released product, the Concerti 108, was a single-driver, back-loaded horn loudspeaker based on Gabourys enclosure design. The new Katana speaker ($12,995 USD per pair) is the top model in Gemme Audios VFlex line. Described as a horn/transmission-line hybrid technique, VFlex refers to the loading strategy Gaboury has developed to enhance the low-frequency output of the type speaker he favors: a smaller enclosure with a single and/or smaller drivers. According to Gemme, a VFlex speaker has a compression chamber behind its midbass driver, and the horns throat is at the end of the chamber. The horn, said to be about 6 long, is obviously folded within the cabinet. Unlike a typical horn, in which the mouth of the horn is large, in a VFlex speaker the horn ends in a "bandpass device" -- basically, a rear-firing port -- that acts as a low-pass filter. Inside is a reflector plate that directs the movement of air to the bandpass device. According to Gemme, the end result in the Katana is broad bass reinforcement from about 20 to 150Hz. The VFlex bass port also offers flexibility by means of a tuning ring. Removing or inserting this ring alters the diameter of the port, and thus the amount of bass reinforcement. The user can use the ring or not, depending on how the Katana interacts with the room. Each Katana has a 1.5" Accuton-sourced tweeter and a 7" midrange-woofer driver, both concave ceramic domes. The drivers are crossed over at about 7.2kHz or 6kHz, depending on which binding posts are connected on the rear panel -- there are two sets of tweeter posts, linked by jumper cables of Cardas wire. In both cases, simple first-order networks are used that result in a significant overlap of the drivers outputs. (First-order networks roll off at only 6dB/octave; if the tweeter starts to roll off at 7kHz, its down only 6dB at 3.5kHz.) According to Gemme, the main difference between the crossover settings is a small bit of attenuation (about 1.5dB) from 5 to 10kHz on axis. Although 1.5dB doesnt sound like much, over such a wide range this kind of attenuation can have a significant effect and, like the bass ring, lets the listener tailor the sound to his or her room and taste. Regardless of the crossover setting used, Gemme crosses the Katanas midrange-woofer driver over quite high, making it obvious that they want that driver to cover a very wide range. Some companies do this to keep the crossover well away from the midrange frequencies. However, as the frequency increases, the midbass drivers dispersion decreases, and wont likely match the tweeters dispersion characteristic when the outputs of the two drivers overlap. Such changes usually dont show up in on-axis measurements, but they do show up off axis. Gemme claims for the Katana a frequency response of 28Hz-20kHz (38Hz-20kHz, +/-3dB), a nominal impedance of 8 ohms, and a sensitivity of 88dB/2.83V/m. Each Katana weighs 100 pounds and stands 40" tall by 8" wide by 18" deep. Insertion of some nicely machined stainless-steel footers adds 2" to the overall height. The speaker strikes an elegant pose -- its narrow front baffle and gentle back-tilt are somewhat reminiscent of the graceful but deadly curved Samurai long swords for which the Katana is named. The cabinets are finished in multiple coats of true piano lacquer buffed to a glossy finish. The side panels are available in gloss piano black, ebony, or rosewood. The speakers name and logo are engraved in gold on the front baffle, and while at first I found this a distraction, with time it grew on me, bringing to mind the image of a fine piano -- which Im certain was Gemmes intent. The Katanas went in my main listening room, which measures 22L by 14W by 8H. I sited them some 42" from the front wall and 25" from the sidewalls, 90" apart from tweeter to tweeter (a little farther than is recommended by the manual), 105" from my listening position, and toed-in by about 15 degrees. An early problem was encountered with the three footers supplied with each Katana, which didnt make the speakers laterally stable on my carpet. While these would work well with hardwood floors, I suspect there would be stability problems on any but the thinnest carpet. To overcome the possibility of a disastrous tipover, I placed Symposium Svelte shelves between the carpet and the footed Katanas. Gemme tells me that theyre developing an outrigger-type stand for the speaker. I used an Audio Research 100.2 solid-state amp or Nagra VPA 845 tube monoblocks, along with an Audion Premier Quattro full-function tube preamplifier. Both of these modestly powered setups worked exceptionally well with the Katanas. Sources were my trusty Oracle Delphi V turntable with SME V tonearm and ZYX Universe-S cartridge, as well as EMMLabs original CDSD transport and DCC2 DAC. Cables were mostly Purist Audio Designs Venustas, and power for the entire system was provided by a dedicated 20A line conditioned through a Shunyata Research Hydra Model-8. Im a little leery about "breaking in" loudspeakers. There may be small changes in performance over the first few weeks, but I think most of the changes ascribed to "break-in" have more to do with the listener becoming acclimated to the speakers sound. This is not dissimilar to opening a second bottle of wine during the course of an evening. The first sip or two from the second bottle will best reveal its differences from the first. But after a couple of glasses, its all good. In short, first impressions are important. In my listening room, I can usually tell within a few minutes if Im going to enjoy a component or if there is some gross deficiency. After that, its nitpicking -- which, after all, is what this hobby is all about. Right out of their boxes, I found that the Katanas produced a satisfyingly full-range, seamless sound that was very easy to listen to. For a "break-in" period of nearly two months, I greatly enjoyed listening to a wide variety of material through them. They never generated an unpleasant sound, while seeming to take nothing away from the music. Then, over my last month with them, I realized I had to write a review using all the usual audiophile descriptors. In keeping with the Katanas provenance, I pulled out several of my favorite albums by Canadian artists with which to evaluate their sound. The small-footprinted Katanas "disappeared" to throw a huge soundstage -- provided such information was on the recording to begin with. The Nylons are an a cappella quartet that started out in Toronto about 30 years ago. Purists may decry their use of electronic percussion accompaniments and their recordings heavy-handed production effects, but Ive found their albums to sound consistently spectacular. Of their recordings, One Size Fits All (LP, Open Air OA-0301) is my favorite. The music spread out from the Katanas to fill the room, such that I almost thought I was listening to five speakers instead of two. The portrayal of depth was also impressive, particularly the falsetto voice on "Silhouettes," as it rose and disappeared into the rear of the soundstage. Cranking up the volume here produced ever more enveloping sound with little evidence of congestion. In addition to this "disappearing" act, the Katanas imaged like exceptional minimonitors, and were superb at rendering spatial cues. In the Nylons beautifully complex doo-wop harmonies, the groups four individual voices were distinctly reproduced and discretely positioned on the stage. Speed and agility were two of the hackneyed audiophile terms I jotted down in my early listening notes. The synthesized drum sounds on One Size Fits All were tight, quick, and punchy. Another example came from the Holly Cole Trios Girl Talk (LP, Alert Z1-81016). On "Cruisin," Dave Piltch uses the body of his upright bass as a percussion instrument, slapping it to provide this tracks rhythmic underpinning. The Katanas transient attacks here were electrostatic-like in speed, but more complete in terms of body and weight. Again and again, the Katana got the midrange right. Girl Talk was recorded live with a single microphone, in a small but empty theater. On most cuts, Cole is accompanied only by piano and bass. The sound was immediate -- Coles voice locked in to the center of the soundfield and was rendered with a pure, natural tone, the sound of the piano was vibrant and lifelike, and the bass was satisfyingly full and free of bloat and overhang. Cabinet colorations were notably imperceptible. While the Katana didnt generate the dynamic slam that my Wilson Audio Specialties WATT/Puppy 7s are known for, they did a remarkable job of reproducing smaller dynamic swings. Holly Coles reading of "Downtown" on Girl Talk, and Neil Youngs debut of his song "Old Man," on Live at Massey Hall 1971 (LP, Reprise 43328-1), served as nice examples of how the superior resolution of a vocalists shifts in dynamics can foster a greater emotional connection to the music. My experience suggests that it is the combination of speaker and amplifier that is most responsible for this aspect of sound reproduction, and not surprisingly, the Nagra VPA 845s did a marginally better job of this with the Katanas than did the Audio Research 100.2, itself no slouch in this regard. Such dynamic swings are just as important in the appreciation of instrumental music. Most of the tracks on Oscar Petersons Mellow Mood (LP, Pausa PR 7044) are anything but. This is Peterson at his finest, overpowering the piano with iron fists in one instant, caressing it with kid gloves a moment later. The Katanas enabled my intimate connection with Petersons expressiveness, readily helping me to appreciate just how masterful a musician he was. A trio session with bassist Sam Jones and drummer Bob Durham, Mellow Mood was recorded in the early 1960s in the home of Hans Georg Brunner-Schwer, owner-producer of the MPS label, before a small and very lucky audience. But while the performances are nothing short of spectacular, this is far from my best-sounding Peterson record. The sound is aggressive and "hot" -- Brunner-Schwers piano sounds somewhat tinny. I can only surmise that this would be exacerbated on the SACD edition, which Ive not heard. The Katana did nothing to alter the curious tonality of the piano, nor did it emasculate the forward, dynamic nature of the sound. However, it did attenuate some of this recordings treble energy, smoothing over some of the unpleasant edge. The politeness of the Katanas tweeters was generally a welcome feature that didnt interfere with my enjoyment of music. On the Cowboy Junkies Whites Off Earth Now!! (LP, Latent Latex 4), the ambience and "air" of this live-in-the-studio recording -- recorded, like Holly Coles Girl Talk, with a single mike -- sounded somewhat diminished. Nevertheless, this took nothing away from Margo Timmins eerie vocals, or the funky sounds of Michael Timmins guitar, which combined to give this album a wonderfully dark and ethereal feel. I strongly preferred using the Katanas "High 1" (upper) tweeter binding posts, as this produced a more open, extended top end in my room. Several songs on Whites Off Earth Now!! feature strong bass lines from Alan Anton. Although the Katana didnt produce bone-rattling bass, what it did generate was more than satisfying -- even surprising, given its 7" driver and compact appearance. Closer examination revealed that a considerable amount of air was moving through the VFlex port with no significant chuffing. Removal of the port tuning ring increased the midbass output, producing what might be described as a "BBC hump," though in my room this came at the cost of some loss of midrange clarity and detail. I did virtually all of my listening with the ring left in place. Based here in Toronto is Tafelmusik, a baroque orchestra using period instruments. In a smallish church near the University of Toronto, they perform concerts for a diverse and casual audience of which I have been a part for over 20 years, intermittently attending their Friday-night performances in an attempt to unwind from the week. Their 1984 recording, Popular Masterpieces of the Baroque (LP, Collegium COL 82-01), is just that: an anthology of baroque standards, all of which Im pretty certain Ive heard Tafelmusik perform live over the years. The recording is beautifully done; after all, it was one of Prof. Keith O. Johnsons earliest engineering efforts. When I played this record through the Katanas, I lost track of all the usual audiophile minutiae. Pinpoint imaging and soundstaging gave way to immersion in the melodies. Air and ambience yielded to the musics rhythmical ebb and flow. Frequency-response concerns were overshadowed by the overall harmonic richness. These are the things that one usually appreciates when attending a concert. During Pachelbels Canon and Gigue in D Major I found myself with eyes closed, lost in thought, nodding my head in time with the music -- much as I do at Trinity-St. Pauls Church after a long work week. In other words, the Gemme Katanas were able to bring me close to the experience of a live event. An affinity with the music and a familiarity with the performances certainly helped me attain this state of musical bliss, but also playing large roles were a remarkably coherent sound free of audible frequency-response anomalies, and a textured and detailed midrange rich in dynamic shading and absent of spurious coloration -- all hallmarks of the sound of the Gemme VFlex Katanas. Loudspeakers are clearly the foundation of any systems sound, which is possibly why audiophiles and manufacturers alike so vehemently defend their choices. For the past few years my choice has been Wilson Audio; currently, their WATT/Puppy 7s serve as my in-house references. In one sense, comparing the Gemme Katana with the W/P7 may seem inappropriate because of the Wilsons far higher cost ($22,400/pair); although many speakers now share this market segment, it seems that none have made it into my listening room. On the other hand, the distinctive house sound of Wilson speakers -- dense, detailed, and dynamic -- is well known to many listeners. Aside from costing twice as much as the Gemme Katana, the Wilson WATT/Puppy 7 is a different animal: a two-box, three-way design with a more complex crossover network. The W/P7 is meticulously designed and built, with an emphasis on resonance-squelching cabinet materials. Thats not to imply that the Katana is slapped together in someones garage. Its enclosure is made of CNC-machined MDF, 50mm thick at the front and back baffles, the cabinets rigidity is enhanced by the use of strategically placed internal braces, its passive components were chosen after extensive experimentation, and the VFlex loading architecture itself is the product of careful thought and innovation. Compared to the Katana, the WATT/Puppy 7 generates a frequency bandwidth extended at both extremes. It can play louder and with more dynamic impact, but also excels at presenting the nuances of the less complex musical material that I prefer. The W/P7 is capable of drawing me into music of all types simply by the sheer amount and scale of sonic information it presents. By contrast, the Katana enchants with a sound thats simpler, more coherent, perhaps understated but just as refined. As such, it offers fewer distractions and permits a more satisfying connection to music. At its list price, Gemme Audios VFlex Katana faces stiff competition from established players, as well as innumerable others approaching the upper echelons of the loudspeaker game. 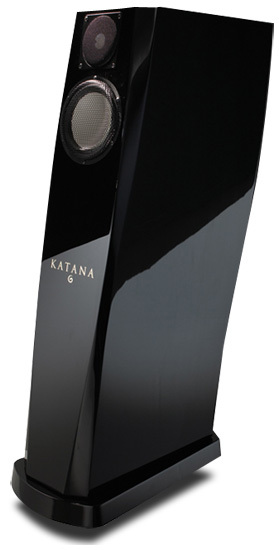 Im not about to proclaim it a bargain at $12,995/pair, but when compared to other speakers using similarly configured ceramic drivers, the Katana is, at the very least, competitive in the global marketplace. The Katana wont appeal to everyone. It wont give you gut-wrenching dynamics, trouser-flapping bass, or dog-hearing highs. It will provide a complete and highly communicative sound in which audiophile pyrotechnics take a back seat to musical involvement. It is also beautiful to look at. If these qualities match your priorities, I suspect youll be captivated by the Katana, and I urge you to give a pair of them a serious audition. With the VFlex Katana, Gemme Audio has raised Canadas standard of audio living by one more notch. Price: $12,995 USD per pair.